I love any and all variations on Pad Thai, Peanut Noodles, etc. If a restaurant has it, I will usually eat it. But after looking at some recipes for these kinds of dishes, they seem to include about 6 different types of oil (slight exaggeration), and fish oil. Fish oil?! Really? That sounds completely disgusting. So, I decided to create a Thai Peanut Noodle recipe that’s easy, gluten-free, vegan or vegetarian, and fish oil-less!! The great thing about this recipe is that there is room for variation; you can add in any vegetables you like, use rice instead of noodles, etc. I just used tofu and broccoli, since that’s what I had in the kitchen at the time. It’s also ridiculously packed with protein: tofu, peanut butter, eggs, and peanuts! You’ll be a body builder in no time (not really). Cook rice noodles according to directions on package. While noodles are cooking, cut tofu into about 3/4″ cubes. Sprinkle cubes evenly with garlic powder, salt, and pepper. Heat oil in a wok over medium-high heat. Once oil is hot, add tofu cubes and stir-fry until golden brown. Add in broccoli florets and the minced clove of garlic to the tofu. Reduce heat to medium, and add the brown sugar, and 1 of the tablespoons of peanut butter. Add about half the soy sauce, and stir until peanut butter is no longer in a glob, but more liquid and coating the tofu and broccoli. Once noodles are cooked, drain and rinse. Add noodles to the broccoli and tofu, along with the remaining soy sauce and peanut butter. Stir to coat all ingredients evenly. Depending on your preference you may want to add more soy sauce. Add in fresh cilantro (setting aside a couple leaves for garnish). Cut the lime in half. Squeeze the juice of one half into the wok, and stir. Cut the second half into 4 pieces to use as a garnish. You’re done! Scoop desired amount of noodles into bowl, top with crushed peanuts, additional cilantro, and lime wedge. This looks delicious! 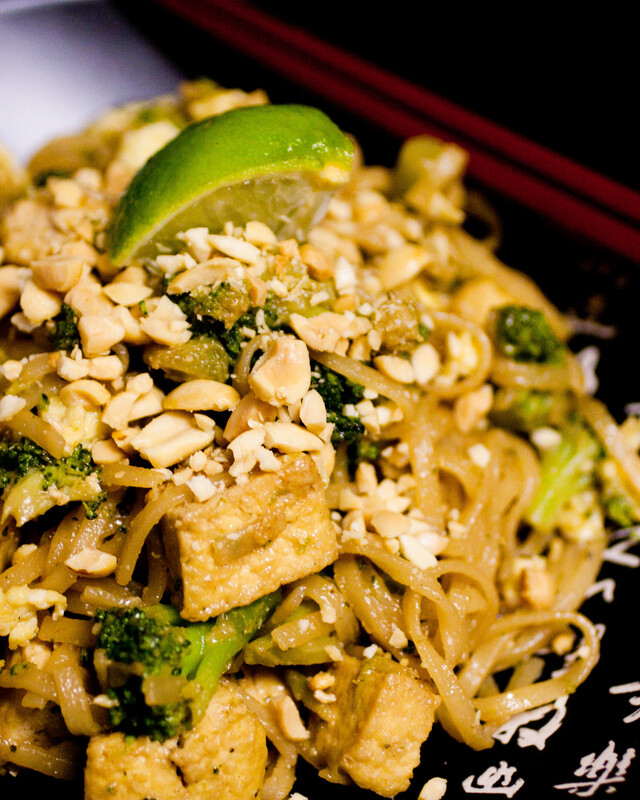 I’m always looking for variations of pad thai.